In 1965 Janis Sternbergs made a few playful lines in some sand on his studio table and was struck by the image he had created. A photograph of this confluence of shadows showed what seemed to be a great earth sculpture of vast depth and breadth. So began an art form which united the talents and skills of engraver, sculptor, painter, and photographer. And when Sternbergs added color effects to his images by use of photo-screen process printing, he employed the skills of still another medium—one in which he is a recognized master. In this book Sternbergs first explains and demonstrates many of the techniques he has developed in producing his dramatic sand "paintings." In a series of illustrations designed to instruct the neophyte sand artist, we see a variety of commonplace tools used to explore the many possibilities of sand as a material for spontaneous work. What one supremely creative mind has done with the medium can be seen in the catalog of Sternbergs's sand images which follows the instructional portion of the book. The 154 black and white photographs not only suggest the range and potential of sand imagery, but attest as well to the imagination and versatility of the artist. Janis Sternbergs, well known as a graphic artist and a painter, was born in Latvia and trained in Vienna. In 1949 he joined the Department of Art at the University of Kentucky, where he taught and practiced printmaking until his retirement in 1970. 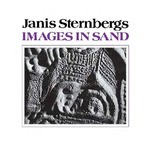 Sternbergs, Janis, "Images in Sand" (1977). Fine Arts. 1.